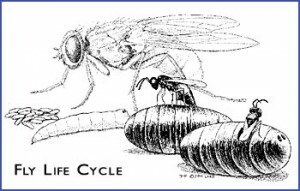 Remember: Anything you can do to disrupt the fly life cycle will help keep their numbers down. Fly parasites prevent adult flies from hatching. These tiny beneficial insects kill the pupae and then use the killed pupae as “nurseries” to grow new parasites. Release throughout the fly season every week or every other week. See the recommended release schedules below. Place the Fly Parasites near manure piles, in stalls and areas of the paddock where horses tend to congregate and areas where moisture encourages maggots to appear. Shortly after the maggots form pupae, the Fly Parasites will attack them. Arrives between Wednesday and Friday. For best results, start in May.